This article is about the current city in Bolivia. For the former Bolivian port of Cobija, see Cobija, Chile. Capital city of the Pando Department, Bolivia. 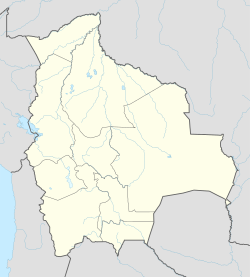 The Bolivian city of Cobija is located about 600 km (373 mi.) north of La Paz in the Amazon Basin on the border with Brazil. Cobija lies on the banks of the Rio Acre across from the Brazilian city of Brasiléia. Cobija lies at an elevation of ca. 280 m (920 ft.) above sea level and has a tropical and rainy climate. Cobija was founded in 1906 by Colonel Enrique Cornejo, originally under the name of Bahía and received its current name in 1908 in commemoration of the former Bolivian seaport Cobija on the Pacific, which has been a part of Chile since the War of the Pacific. In the early 1900s, Cobija experienced a boom as an India rubber industry center. When the industry collapsed, a major source of income being lost, Cobija became impoverished and its population fell. Nowadays, Cobija is developing again and its population is increasing. Currently, the region's primary industry is Bolivia nuts, although tourism and commerce are growing. There is a Free economic zone in the city, the largest in Bolivia. The inhabitants of Cobija has risen very strongly during the past two decades to more than five-fold. Currently the estimated population is as much as 60,000 inhabitants with a population growth of 6 to 8% per year. The city of Cobija sits on a sharp curve of the Acre river. Located at an altitude of 280 metres (920 ft) above sea level and in the north-western jungle region – in Brazilian border – Cobija is considered the rainiest region in Bolivia. It is also a warm spot (exception made for a couple of weeks a year, when a fresh wind from the south blows), with day temperatures above 26 °C (79 °F) most of the time. Cobija has two seasons: The rain season (when is possible to enjoy powerful rainfalls and the vegetation is at its best) and the dry season (when roads are good and excursions deep into the Jungle are made possible, to "lago Bay" for instance). Usually locals use the hottest hours of the day to stay at home, have lunch and a good siesta. But the most active ones enjoy also outdoor activities. The average annual precipitation averages between 1,500 to 2,000 millimetres (59 to 79 in) depending upon the seasonal flooding intensity. Furthermore, contrary to popular belief, Cobija is not the wettest area in Bolivia, as the average annual precipitation in the Chapare lowlands of Cochabamba can receive more than 5,500 millimetres (220 in) of rain per year in some areas. Old facade of Cobija airport, before the reformation. Cobija is served by major Bolivian airlines at Captain Aníbal Arab Airport and by buses to Riberalta. ^ "Klimatafel von Cobija, Prov. Pando / Bolivien" (PDF). Baseline climate means (1961-1990) from stations all over the world (in German). Deutscher Wetterdienst. Retrieved 27 January 2016. This page was last edited on 12 July 2018, at 21:15 (UTC).